Set in Italy during the last two years of the second World War, this story follows the life of a remarkable young man, Pino Lella, who finds himself assigned as the driver of one of the most powerful Nazi officials in Italy. He accompanies this General throughout northern Italy as the war deteriorates and comes to a violent and tragic end. The scenes of brutality on all sides are shocking and depressing, not only on the part of the Nazis towards their captives and slaves, but also on the part of Italians who at the end of the war let their anger erupt against the dictator Mussolini and others. There are many scenes of heroism and bravery as well, and the story of Lella makes it all very personal throughout. His own tragedies are particularly painful and sad as the war ends. This is an extraordinary life in all respects, not only his wartime accomplishments but his life afterwards which is recounted at the end of the novel. His encounters with various famous people throughout his life are fascinating. A very worthwhile story that author Mark Sullivan was lucky enough to learn of, then putting several years of research into piecing together as many of the details as he could. He presents it as a biographical / historical novel but inasmuch as it is based upon the true story of Pino Lella I take it as fundamentally a true story. Remarkable to read, both sad and inspiring. A Kindle First selection that is masterfully written with complex characters and heart-pounding scenes. It takes place in Italy -‘the forgotten front’- during WW II and the reader is drawn into a web of intrigue. Pino Lello, 17 years of age, is wise beyond his years and intelligent, as well. It is a gripping story of resilience, the indomitable spirit of a young man that knew no boundaries and courage that sustained him during dark hours. When reading the first portion, I was wondering if (and how) this intense pace would continue. The climbing scenes through the mountains gave me a real shot of adrenaline. I felt as though I was one of the climbers and not a reader. This is also when the echoes of ‘Nessun Dorma’ were played with such passion. For me, this is one of the underlying themes in the story – ‘none shall sleep’. And, Pino Lello has taken that to heart for the remainder of this story. Just a gripping and harrowing Kindle First selection which I feel is the best one I have read. Full of action and suspense which will keep you on the edge of your seat for the duration. 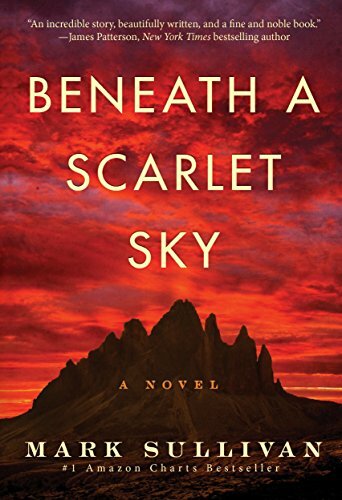 I’ve read nearly every word Mark Sullivan has ever published – so I can say with authority that this work, Beneath a Scarlet Sky, stands as the ultimate fusion of his Pulitzer-nominated journalistic skills and his mastery of the thriller genre, which he’s honed at the keyboard he sometimes shares with James Patterson. He takes us deep inside the love story of his discovery, the unknown hero, Pino Lella, and he crafts an epic tale set against the backdrop of Nazi-occupied Milan and the Italian Alps during World War II that is as intimate and tragic as it is thought-provoking and triumphant. Every page, every step crackles. Each twist, rooted in years of first-class reporting, shocks you anew. Through Sullivan’s gripping cast of characters, the unreality and brutality of war meets its match in the guts and wits and soul of Pino Lella, his family, his friends and cohorts. This heretofore untold story has been etched in my heart and mind with a telling that is equally cinematic and literary. With this, perhaps his masterwork, Sullivan has reached a pinnacle in storytelling – and readers everywhere, like me, will be better for living it through his words. Of course, it is Pino Lella we must also praise and thank – for what he did with his young life, his uncommon bravery, his story and letting Sullivan share it with us. I wish I could read it again for the first time.